The pros are out in full force today on Pokerstars as the WCOOP is drawing to a close. Today we have the $5k H.O.R.S.E. event taking place as well as the $1k Limit Hold'em event. Both events feature some of the biggest names in the poker world, with the $5k H.O.R.S.E. event boasting an especially rich array of online and live poker talent, including the likes of Greg Raymer, Barry Greenstein, Michael Mizrachi and Daniel Negreanu. 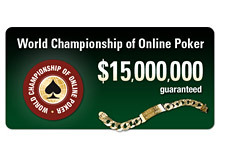 On Sunday, the $2600, five million dollar guaranteed Main Event starts up. This event will be an absolute marathon session, with an expected completion time of about noon EST on Monday morning. If this wasn't big enough, you also have the normal line-up of big rebuy tournaments, the High Stakes Showdown (should be an especially good turnout this weekend) and the dozens and dozens of satellite tournaments into the WCOOP main event. All eyes will be on Pokerstars this weekend as most of the top talent in the poker world will converge on the site for the weekend. Who will win the main event? Will it be a big-name "live" pro? Will it be a young poker sensation such as Chad Batista or Sorel Mizzi? Or will it be a complete unknown who qualified through a satellite? We'll soon find out.